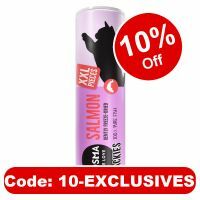 Cosma Snackies XXL Freeze-dried Cat Snacks | Top deals! 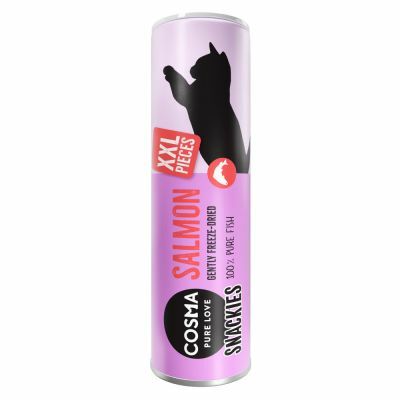 Perfect for larger cat breeds: Cosma Snackies XXL: extra-large, natural cat snacks. 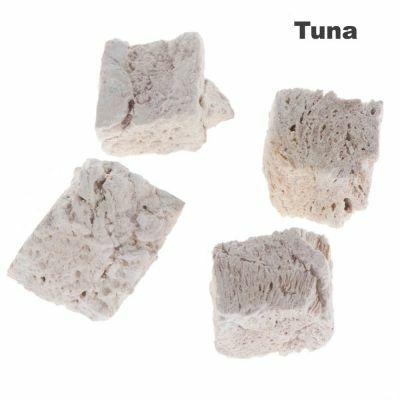 Made from gently freeze-dried 100% pure chicken, tuna, salmon or white fish, your cat will love them. Kitty loves these samples! :"She loves to chase pieces across the floor, gobbles them at first offering, and desperately tries to find the tube when I put it away. She’s a big fan!" 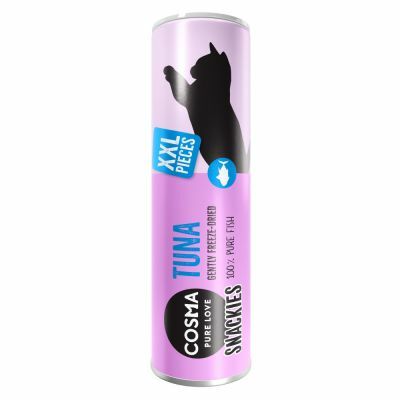 Cosma Snackies XXL are natural, grain-free cat snacks made from 100% pure chicken, tuna, salmon or white fish. 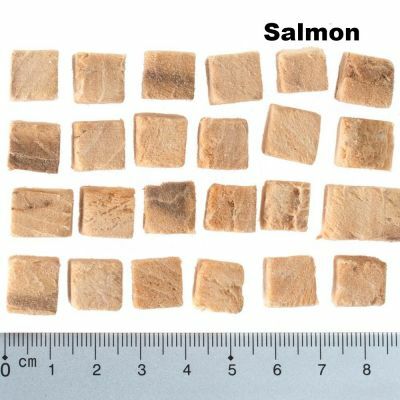 Each individual Cosma Snackies XXL is made using a very gentle and lengthy freeze-drying process. 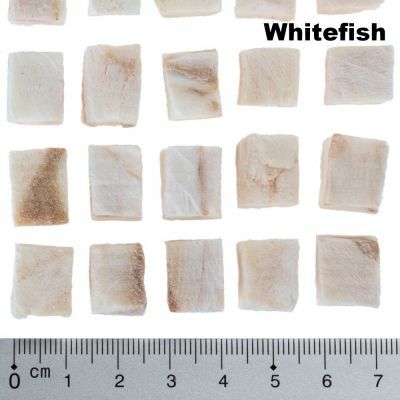 The fish or meat is heated at a very low temperature to slowly extract the water. 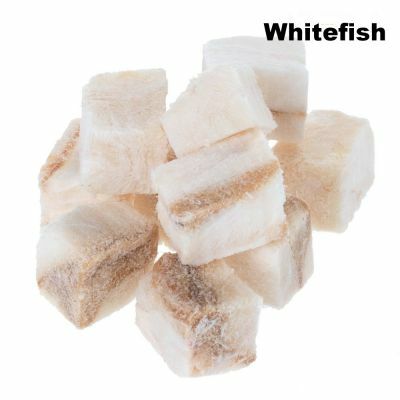 This process ensures that the snacks retain all their vital nutrients as well as the intense taste which your cat adores. Cosma Snackies XXL are completely natural and made without artificial additives, colour, attractants or preservatives. 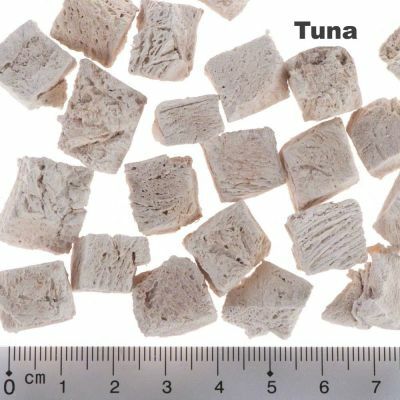 Freeze-dried Cosma Snackies XXL are recommended by vets and cat breeders as a healthy, well accepted cat treat. 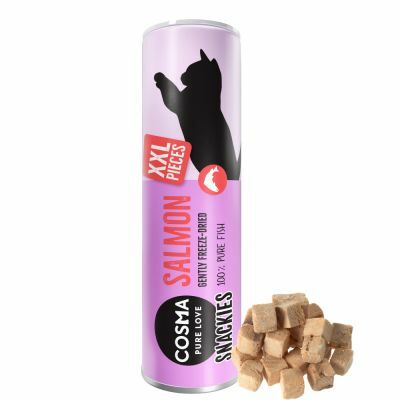 Premium quality Cosma Snackies XXL are available in a re-sealable tube which keeps the natural meat or fish fresh and tasty. You can feed your cat Snackies XXL several times a day as an appetising snack, or try something different and scatter a few over your cat's normal food. Your cat will love the delicious, pure taste. Cosma Snackies - the pure, natural snack for your cat. Cosma Snackies XXL are a supplementary food. Feed as a treat or between meals. Adjust the amount of your cat's daily food accordingly. Please make sure your pet has always has fresh drinking water available. She loves to chase pieces across the floor, gobbles them at first offering, and desperately tries to find the tube when I put it away. She’s a big fan! I am a large and, dare I say it myself, handsome fella and I'm very particular about my food. However I LOVE these chicken snacks. I'm usually well mannered when it comes to food. I don't hold with miaowing or begging, so undignified. But with these treats I cannot help myself. I have been reduced to miaowing loudly until my, sometimes slow, human produces them. If only I could open the tubes myself I wouldn't have this problem! I made sure that my human ordered plenty more with our next order. At first the one cat didn't seem very impressed, but the other went mad whenever he heard the sound of these snacks coming out. Now the other only has to see me lift the tube up and he's by my feet! My cat loves these the best! 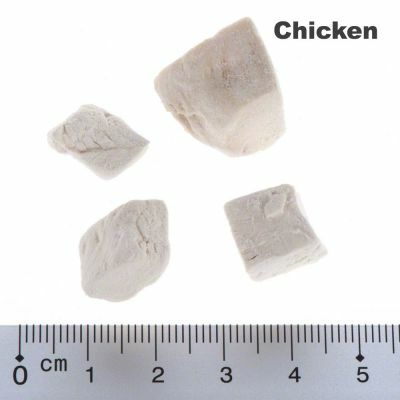 After trying my fussy cat with all the flavours of the normal size I found he liked chicken the best. Now I've found these XXL ones he begs for these several times a day and he loves them above all else. She especially likes the XXL version. The snacks are thoroughly chewed and not a crumb is wasted. My fussy 1 year old ragdoll is very fussy, but she does love these, she likes the other flavors but chicken is her favorite, I actually add some warm water on to 10-15 and then serve them, and she likes it, if only these snakies were complete cat food. I like to sprinkle different treats into a puzzle board toy for my cats, and they can be quite fussy about which ones they pick to eat. They always eat the chicken flavour Cosma snacks first, and then meow at me for more, even though the game is still full of other treats! 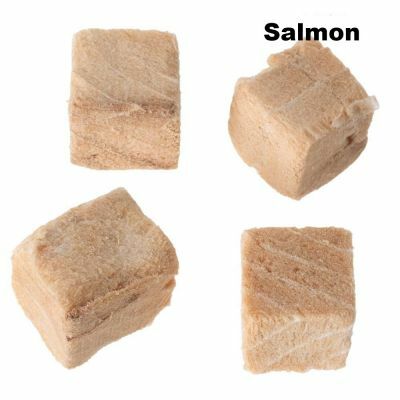 Both of my British Shorthairs love these treats, and they're healthy as well! The price is a bit on the luxurious side, but who doesn't love to treat their pets once in a while? And my cats practically inhale the Snackies to the last crumb, so I get good value for my money! 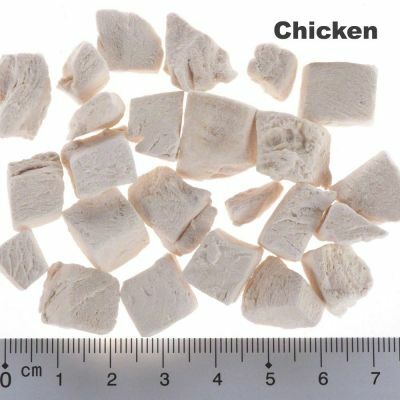 Unfortunately I have to say that most of the snackies in my packet on XXL Chicken Snackies were just as small as in the normal packets. But my cats still love them! 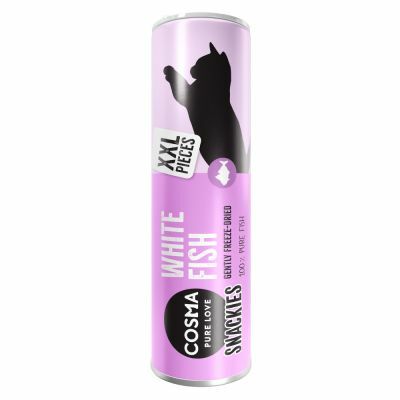 My cat loves all the different varieties of Cosma Snackies, and now with the XXL versions he actually has to chew them instead of sucking them up like a hoover. As soon as he finishes one he wants another. A shame that there are only two flavours in XXL. My cat loves chewing on the larger Snackies, both chicken and tuna. He also loves the other snacks from Cosma - he's a big fan!